Set sail this weekend with the Ocean Institute, attend a painting workshop or see a live music performance. In South Orange County, there is plenty to do this weekend. 10 a.m.-2 p.m. Bring out your inner artist while surrounded by books and good company. All materials are provided and no registration or fee is required. Dana Point Library. 33841 Niguel Rd., Dana Point. 949.496.5517. 10 a.m.-5 p.m. This two-day abstract painting workshop runs Saturday and Sunday with teacher Elaine Cohen. The instruction is tailored to students’ experience and interest, and includes options for medium, style, colors, blending and more. Visual and text references will help guide students. Cost is $250 per student. San Clemente Art Supply. 1531 N. El Camino Real, San Clemente. 949.369.6603. www.scartsupply.com. 10 a.m.-3 p.m. A rare opportunity to tour two visiting ships, the Hawaiian Chieftain and Lady Washington will be offered at The Ocean Institute. The historical ships are visiting from the state of Washington. Tours are held 10 a.m.-4 p.m. from Tuesdays to Sundays until January 17. Tours are free with the price of admission to the Institute. 24200 Dana Point Harbor Drive, Dana Point. 949.496.2274. www.ocean-institute.org. 8-11 p.m. Listen to live music from Felisha at Barnoa Wine Bar. 831 Via Suerte, Suite 106, San Clemente. 949. 388.4378. www.barnoawinebar.com. 7:30-10 a.m. Start your year off with a guided nature hike at the Rancho Mission Viejo Reserve. Ages 10 and up. Tickets are $10 per adult, $5 per child. Reserve your spot ahead of time. 28811 Ortega Highway, San Juan Capistrano. 949.489.9778. www.rmvreserve.org. 9-11 a.m. Engage with your local community to help protect Orange County beaches and waterways by removing trash from Calafia Beach with OC Coastkeeper. Learn about ocean pollution and the danger it poses to local ecosystems, citizens and the economy. When you enter into Calafia State Beach, tell the park attendant you are there for the beach cleanup and get free parking at the beach. Once you enter the park, drive to the parking lot at the bottom of the hill. 243 Avenida Calafia, San Clemente. 714.850.1965. www.coastkeeper.org/san_clemente_state_beach_cleanup. 9:30 a.m. Tree of Life Nursery owner, Mike Evans will share from the nursery’s booklet, “Creating and Caring for your Native Garden,” teach you how to create a thriving and enjoyable native garden. The workshop is the first of a six-part series. Tree of Life Nursery. 33201 Ortega Highway, San Juan Capistrano. 949.728.0685. www.californianativeplants.com. 1-4 p.m. Witness the annual mock cannon battle at the Ocean Institute. 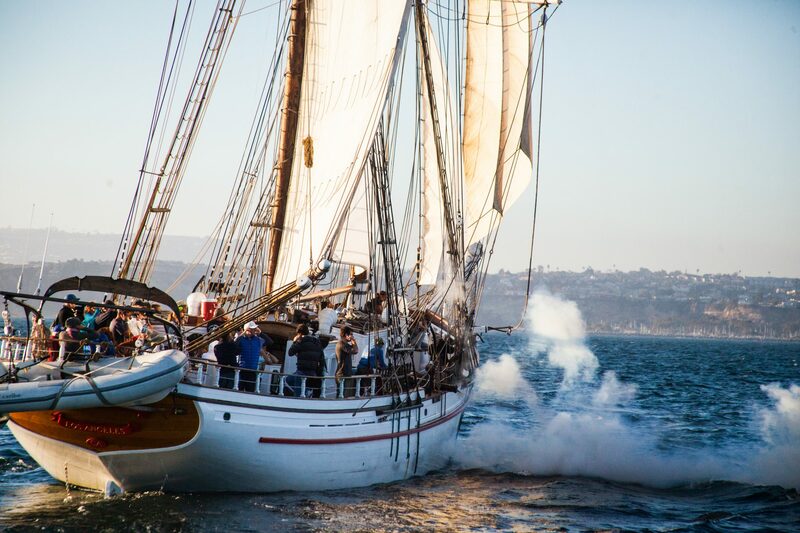 The Spirit of Dana Point will engage in a pretend fight with visiting tall ships, the Hawaiian Chieftain and Lady Washington. Enjoy blasting cannons, towering rigging, bustling decks and the magnificence of canvas full of wind. Work with the crew hauling up sail or simply sit back and enjoy the spectacular demonstration of skill, knowledge and survival. Tickets are $60 for adults, with discounts for seniors, military and children. 24200 Dana Point Harbor Drive, Dana Point. 949.496.2274. www.ocean-institute.org. 2:30 p.m.-1:30 a.m. Live music fills the room at The Swallow’s Inn throughout the afternoon and evening. 31786 Camino Capistrano, San Juan Capistrano. 949.493.3188. www.swallowsinn.com. 8-11 p.m. Listen to live music from Mikey de Lara at Barnoa Wine Bar. 831 Via Suerte, Suite 106, San Clemente. 949. 388.4378. www.barnoawinebar.com. 8-9:15 a.m. Join an OC Parks Ranger and fellow hikers on a one-mile trek in the Bell Canyon area of Caspers Wilderness Park. It’s free to attend the hike. 33401 Ortega Highway, San Juan Capistrano. 949.923.2210. www.ocparks.com/caspers. 10 a.m.-2 p.m. Yoder Family Sundays offer free admission for part of the first Sunday of each month to Casa Romantica. Inside, there will be activities and a noon-time program based on the “Casa Captivating” theme for that month. 415 Avenida Granada, San Clemente. 949.498.2139. www.casaromantica.org. For a full calendar list, visit our Getting Out Calendar by clicking here.